Happy Monday! 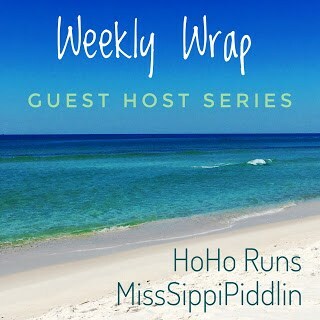 It’s time for the Weekly Wrap with HoHo Runs and MissSippi Piddling! I have been scheduled to the teeth over the last month, and it’s a pretty delicate balance I’ve been managing to maintain. I’m definitely one of those people who likes to keep busy, but I am also an extroverted introvert and while I can do the whole social thing, after extended periods of putting myself out there, I do need some time to recharge. I was sorry to have to say goodbye to Meghan after our amazing evening, but I needed to get home to see the boys for a bit before heading out to a blogging event. The St. Augustine Moms Blog hosted a contributors afternoon at Board & Brush, a new creative studio where groups can gather to assemble and paint customized wood signs. We ordered our graphics in advance, brought our own wine and snacks, and when we arrived, everything was ready for us to go. The owner and staff helped us distress, sand, assemble and layer our paints, and it was nice spending time with fellow contributors. The end result was fabulous and I can’t wait to do another class. There are some adorable holiday and seasonal signs that would make amazing additions to our home. I guess I can’t leave Sunday without mentioning that Game of Thrones is rocking my socks this season. I can’t believe there is only one more episode in this shortened season! We have started falling into our regular routine with everything, so that’s a plus. Even though it was a rest day, I still had to be up and at the school early, so I didn’t really get to sleep in, but that’s ok. The coolest thing about this day was I had my first post published on The Tempo, Rock ‘n’ Roll’s running blog! Check it out here and don’t forget, we’d love to see you at one of Rock ‘n’ Roll’s Tour Stops this year! Remember that code RNB15 will save you on most races! If you follow me on Instagram, you probably saw the giant friend I discovered by way of my Knuckle Lights early Tuesday morning. This guy is about two and a half inches long, and he has been out there every day before the sun comes up. I may have to give him a name soon. At any rate, I managed to avoid a web in the face and got in five miles. I was very grateful for a quiet Wednesday. We did have karate, but I was able to get some writing done while little man was in class. Fortunately, this was just the breather I needed to get myself back on track. I had to get up even earlier than normal for my run because little man had a 7:30 AM dentist appointment! Yikes! In the meantime, I earned my Launch and bonus Summer Strides medals from the Rock ‘n’ Roll Summer Virtual Series! I can’t wait for these to come in the mail in a few weeks! In other news, little man had his best visit yet – no cavities and everything is looking fabulous. Way to go, buddy! When I dropped him off at school, I spent some time volunteering and working on some last minute things for our upcoming Movie Night. I feel like school is coming together for us all, and I love it. Friday was all about getting ready for our Family Movie Night. I cleaned the house, caught up on all the laundry and worked on final signs for our photo booth and food tables. and then my co-team-member picked me up around 4:00 PM and we headed to the school to set up. and get everyone settled for a great time watching a movie in the cafeteria. We were exhausted when everything was broken down and cleaned up, but a margarita with some friends was just what the doctor ordered, and we enjoyed some time winding down from a fabulous night. I was thrilled that a neighborhood friend agreed to join me for my long run. She did five miles with me, which definitely helped the time pass more quickly. After a shower and breakfast, we met friends for our monthly family day at a trampoline park. There were some new additions to the ninja warrior course, and little man surprised us by climbing on up and making a leap for the big bag. He didn’t quite make it, but he also wasn’t too far off. Of course, I had to calm my nerves with a wine slushy. We had a great afternoon and were happy to schedule another one in a few weeks. I know I am stretched thin right now, but I always do better when I’m busy. I’ve been meeting and spending time with some amazing people, and I am grateful for the opportunities to push out of my comfort zones and challenge myself. There are more big events coming up this week and this month (can you believe it’s almost September? ), so stay tuned to see if I can get it all done! Thoughts on the season finale of Game of Thrones? All of the things you did, you definitely needed that wine slushy! Sounds like another great week of the whole family! It was the most delicious wine slushy. It makes me want a slushy machine. I have yet to watch Game of Thrones, I am sure I am missing something! Big week for you! Congrats on the published post and that class looks like to much fun! I think you either love Game of Thrones or you don’t. It’s definitely not for everyone, but I’ve been invested since I read the books. LOL! The class was a blast! I’m going again next week with my mom and some friends. LOL! They are some really cool medals! That SPIDER looks amazing!! I’m so in love with wildlife and insects (unless of course it chases me). I am terrified that one day, this one is going to get sick of me staring at him and jump at me. It was eating a ladybug the other day! So cool and so horrifying all at once! OMG I WANT THAT WINE SLUSHEE. LIKE RIGHT NOW. Omg I am going to dream of that tonight! LOL! A few more months for you, right? It was really quite delicious. Love those RNR Virtual Medals! Speaking of dentist, all three of mine need to go before they do get a cavity. Glad you had a friend join you for part of your long run! That does make the time go by faster! Have a great week! Eek! I hope you can avoid the cavities! Hope you have a great week, too! I am always amazed at how much you are able to fit into one week!! The busier I am, the more motivation I seem to have. It’s weird. I can be so much more productive. Game of Thrones has not yet gotten my attention….I know, I’m one of the last ones remaining that have not watched it. Looks like you have a lot of activity going on! There are lot of people who aren’t into GoT, and I totally get it. It’s really one of the most riveting series that I have ever watched, and I am going to be sorry when it ends. Congrats on getting your post published! I’m still in the editing phase. I haven’t gotten my virtual medals yet! I have another one I have to finalize and submit! Deadlines, deadlines, deadlines! I haven’t gotten mine yet either. I think they are due to ship next month. Loved Game of Thrones, sad that they narrated John’s That and Dany’s relationship as they were you know. That spider….ugh, I would die!!!!! Glad you had a light to lead your way. I wasn’t really happy about the Jon and Dany thing – I knew it was going to happen, but ick. That spider was not cool. I didn’t see him the other morning so maybe he found a new residence. I would have screamed if I saw a spider like that, although I do share my workout space with smaller ones. Those medals are awesome! LOL! I almost did! He’s HUGE!